The US space agency has just landed a huge new robot rover on Mars. The one-tonne vehicle, known as Curiosity, was reported to have landed in a deep crater near the planet’s equator at 06:32 BST (05:32 GMT). 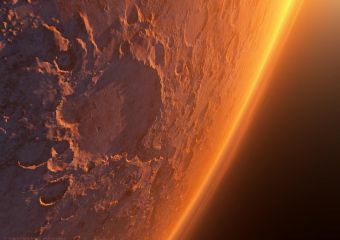 It will now embark on a mission of at least two years to look for evidence that Mars may once have supported life. A signal confirming the rover was on the ground safely was relayed to Earth via Nasa’s Odyssey satellite, which is in orbit around the Red Planet. The success was greeted with a roar of approval here at mission control at the Jet Propulsion Laboratory in Pasadena. The mission has even already sent its first low-resolution images – showing the rover’s wheel and its shadow, through a dust-covered lens cap that has yet to be removed. A first colour image of Curiosity’s surroundings should be returned in the next couple of days. The descent through the atmosphere after a 570-million-km journey from Earth had been billed as the “seven minutes of terror” – the time it would take to complete a series of high-risk, automated manoeuvres that would slow the rover from an entry speed of 20,000km/h to allow its wheels to set down softly. The Curiosity team had to wait 13 tense minutes for the signals from Odyssey and the lander to make their way back to Earth. After the landing, the flight director reported that Curiosity had hit the surface of Mars at a gentle 0.6 metres per second. The mission team will now spend the next few hours assessing the health of the vehicle (also referred to as the Mars Science Laboratory, MSL). This is the fourth rover Nasa has put on Mars, but its scale and sophistication dwarf all previous projects. Its biggest instrument alone is nearly four times the mass of the very first robot rover deployed on the planet back in 1997. Curiosity has been sent to investigate the central mountain inside Gale Crater that is more than 5km high. It will climb the rise, and, as it does so, study rocks that were laid down billions of years ago in the presence of liquid water. The vehicle will be looking for evidence that past environments could have favoured microbial life. Scientists warn, however, that this will be a slow mission – Curiosity is in no hurry. For one thing, the rover has a plutonium battery that should give it far greater longevity than the solar-panelled power systems fitted to previous vehicles. “People have got to realise this mission will be different,” commented Steve Squyres, the lead scientist of the Opportunity and Spirit rovers landed in 2004. “When we landed we only thought we’d get 30 sols (Martian days) on the surface, so we had to hit the ground running. Curiosity has plenty of time,” he told the BBC. Initially, the rover is funded for two years of operations. But many expect this mission to roll and roll for perhaps a decade or more. This entry was posted in Nasa, new technology, Science & Enviroment and tagged Mars, Space.